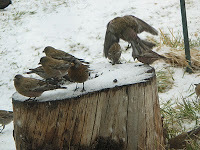 Rosy Finches, all three species, have been coming to my yard since I started feeding birds here three years ago. This year, they arrived on December 4th. It started with only 40-50 Rosies and quickly grew to as many as 5-600. This is the first year they have stayed around as much as they have; longer between snowstorms and longer through the days they visit. 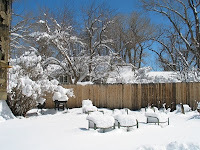 About 16-18 inches of snow fell here a few days ago, and another such storm came yesterday, so I assume the Rosies will be here close to the end of March, but I don't believe I've ever had them here in April. It will be sad to see them go; as the seasons change, so do the birds that visit. For example, the Evening Grosbeaks, here about all year, have been coming in numbers of 40-50 at a time. Not only their numbers, but the color of their bills tells me Spring is near. 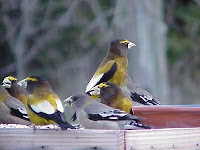 Have you noticed the Evening Grosbeaks bills turn a beautiful teal color during breeding season? Yes, and their bills are changing now, I detected the blue/green color on several, if not most of the visiting big beaks. 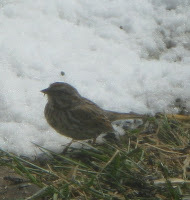 This Song Sparrow is one of 3-4 that I see in the yard at any given time. 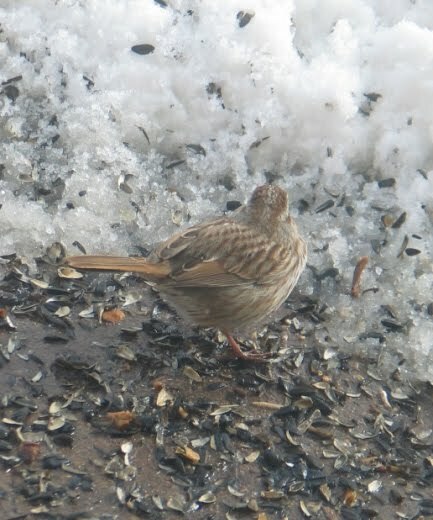 Also around with the Red-winged Blackbirds, Starlings, and Eurasian-collared Doves, are lots of Juncos, House Finch, Am. 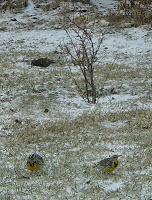 Goldfinch, Pine Siskins, Song Sparrows, Mtn and Bk-capped Chickadees, Wt-breasted Nuthatchs, Downy and Hairy Woodpeckers, Northern Flickers, Blue Jays, the occasional Scrub Jay, Crows and Ravens are around, 40-50 Evening Grosbeaks, a few American Robins and a couple Cassian’s Finches. 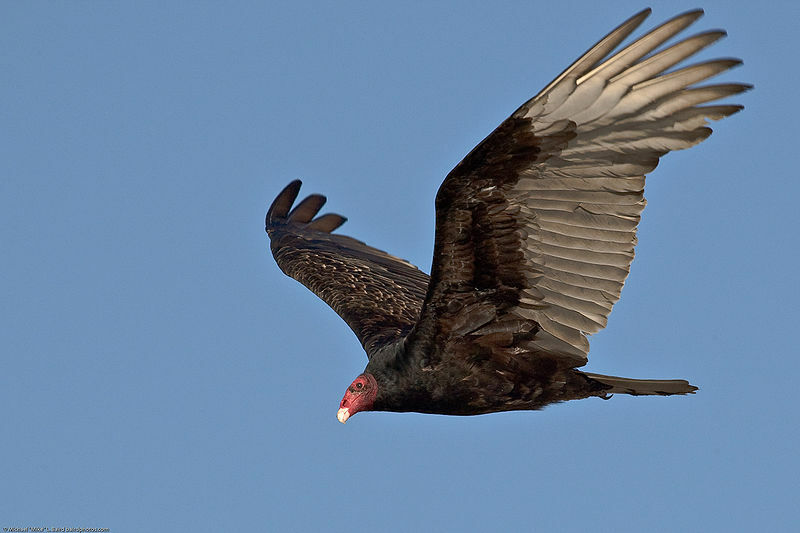 The Meadowlarks didn’t stay but the one day, the Lewis’s Woodpecker hasn’t been seen in a couple weeks, but the White-winged Dove was here again today and I saw the FOS (First of Season) Turkey Vulture in a nearby tree on March 20th. In the past week I’ve watched a Red-tailed Hawk, a Cooper’s Hawk and a Great Horned Owl watching the yard. 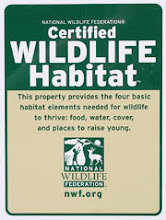 It's time to put out the Hummingbird feeders! I can't help but share some of the Rosies. This is one of three places they congregate, just outside my back door. 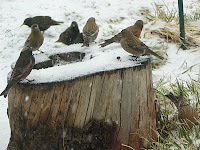 Yes, every bird you see here, is a Rosy-Finch. Oh, and the White-winged Dove showed up, too. 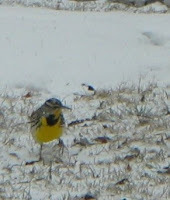 Meadowlarks! Isn't March 14th a little early? There are more pictures below, who knew they'd come to a yard? After a week of clear, sunny weather much of the snow has melted and turned my yard into a mud-pit. 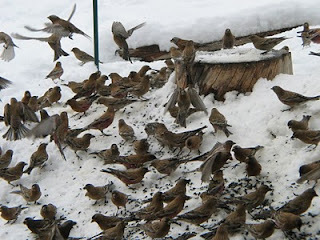 And dispite my warnings, some folks have waited too long for a sure thing seeing the Rosy-Finches that visit here. Generally, these guys show-up when the mountain weather is particularly bad. That said, they've been here for a good week since the last snow storm, but their numbers dwindled from around 500+ to maybe just 250 pink-butts that come and go before long before noon. Yesterday morning only 100 or so showed up in the early morning and were gone by 10 o'clock. Late morning visitors did manage to see the Lewis's Woodpecker, a few Evening Grosbeaks, a Cassin's Finch and several other woodpeckers, but were disappointed not to see Rosies. Early afternoon visitors didn't see much at all. This morning 100-200 Rosies showed up, along with at least as many Red-winged Blackbirds. The flock of blackbirds grew, but the Rosies were gone by ten o'clock. And then the snow started. 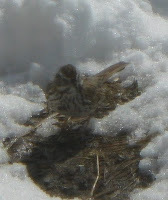 I was absolutely tickled that the Rosy-Finches came back; first time they've visited in the afternoon in over a week! All three continue to come...including the Coastal or 'Hepburn's' variant. They are such a delight to have back. 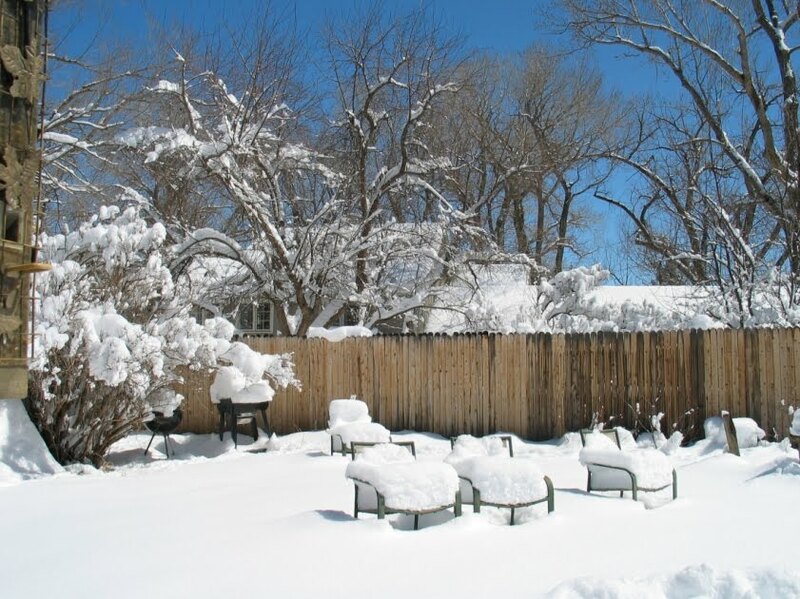 I just hope we get lots of snow because some folks plan to stop by Monday and Tuesday...early. I'm thinking they might just get to see hundreds of the pink-butts. 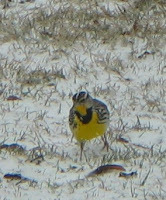 While watching the birds and cursing the big, weedy gluttons, I noticed a bright splash of color and realized there was another fairly good-sized bird in the yard that I'd never seen before! A first! 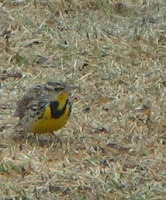 I have seen Meadowlarks before, just not in my yard, so it was easy to find the bird in my field-guides, but not so easy to determine if this was an Eastern or a Western Meadowlark, as their areas apparently overlap here. I felt better when I read that basically the easiest way to tell them apart is by their song, but they weren't singing in the snow. It was pretty neat watching these big birds feeding; they'd slam their rather large bill down into the grassy mud and open it...looking all the time for what might turn up. 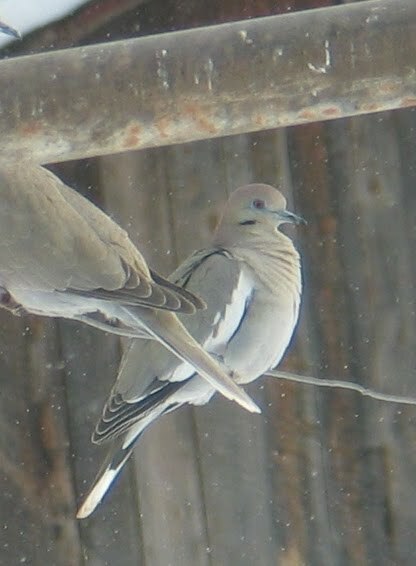 They worked the yard from one side to the other and stayed through several rounds of blackbirds, starlings, pigeons (that's what I call Eurasian Collared-Doves out of total disrespect) and Rosy-Finches all winging up and back all in unison rather like schools of fish. 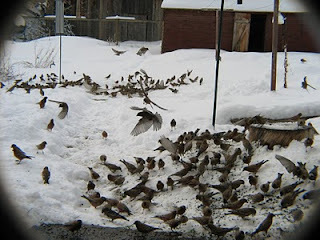 As winter winds down and spring arrives...my yard birds are beginning to change. All the Rosies continue to come and no longer ONLY when it snows. Apparently they know a good food source when they find it. 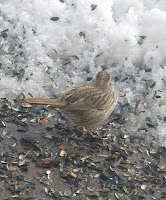 Yesterday, while there was still snow on the ground, it is receding and hasn't snowed in a week yet a visiting birder counted 240 Rosy-finches...all three species. He also was granted a visit by the unusual winter Lewis's Woodpecker, who is still around. The day before I'd seen two Cassin's Finch feeding near a bush under a feeder, their bright red crests shockingly identifiable as the sun back-lit the little, pale-breasted birds. And as I got up early to fill feeders before the visitor arrived, I walked out to find a Great Horned Owl calling from the very top of the huge evergreen...and another answering nearby. Yup, spring is coming! 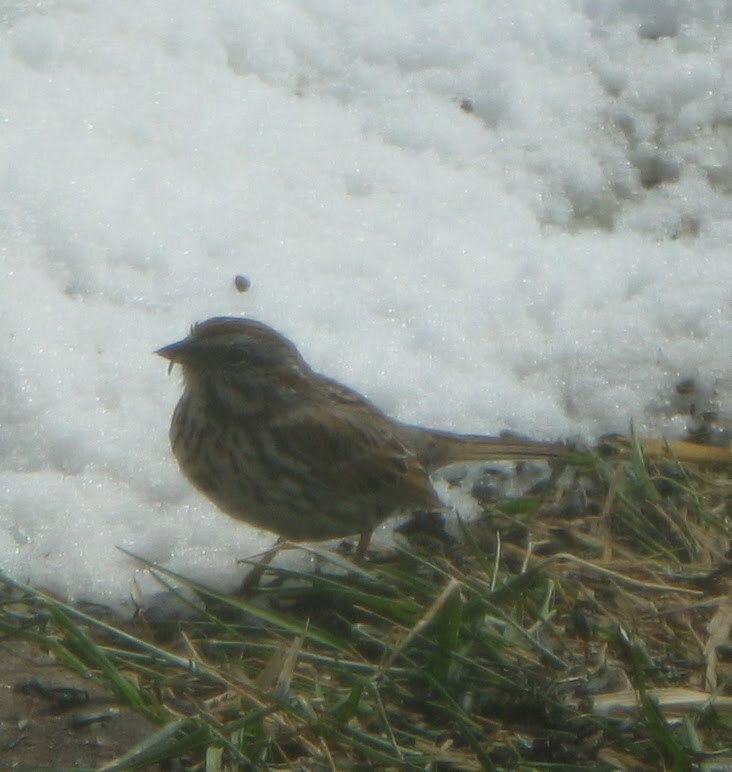 Pine Siskins, Red-winged Blackbird, Western Scrub-Jay, Cooper's Hawk, Brewer's Blackbird, Song Sparrow, Sharp-shinned Hawk, Common Raven, American Robin, Lewis's Woodpecker, Cassin's Finch, Evening Grosbeak, Black Rosy-Finch, Brown-capped Rosy-Finch, Gray-crowned Rosy-Finch, Blue Jay, American Crow, White-winged Dove, American Goldfinch, White-breasted Nuthatch, Mountain Chickadee, Hairy Woodpecker, Black-capped Chickadee, Dark-eyed Junco, House Finch, Northern Flicker - Red-shafted, Downy Woodpecker, Black-billed Magpie, European Starling, House Sparrow, Eurasian Collared-Dove.